Dye Penetration Testing (PT) method of inspection is a non-destructive test for discontinuities open to the test surface. This method can be used on aluminum, magnesium, brass, copper, high quality castings, steel, stainless steel, carbides, certain plastics and ceramics. The first and most important step in PT testing is to preclean the test surface to be examined. After the precleaning, the dye penetrant is applied to the entire area of interest to be tested. The penetrant, which remains in a liquid form, is attracted into surface breaking flaws by capillary action. After the penetrant is allowed to dwell on the test surface for a predetermined amount of time a developer is applied to pull the trapped penetrant back to the surface where it forms an indication. The developer typically creates a nice white background which contrasts well with the deep red indications that are produced if any discontinuities are present. The test surfaces must be clean of foreign materials, coating, and paint. Any dirt, oil, etc will prevent the absorbsion of penetrant. The test piece must be completely clean and allow ample drying time before applying the penetrant. There are many different types of dye penetrants utilized in the industrial market. All of these have their particular applications, strengths and weaknesses. The trained technician will always pick the penetrant type that is best suited for the inspections to be performed. Once this penetrant type is established, the penetrant is applied to the test surface in an even layer. It is very important that 100% of the area to be inspected has an adequate amount of penetrant applied to it. After the application, the penetrant is allowed to sit on the test piece for a predetermined amount of time (dwell time). Once the dwell time of the penetrant has passed, wipe the surface clean with a dry clean, lint free cloth. Continue doing this until you see that no penetrant is being removed from the test area. The final cleaning can be performed with a rag that has had a small amount of solvent cleaner applied to it (damp rag). NEVER APPLY cleaner directly on the test piece. 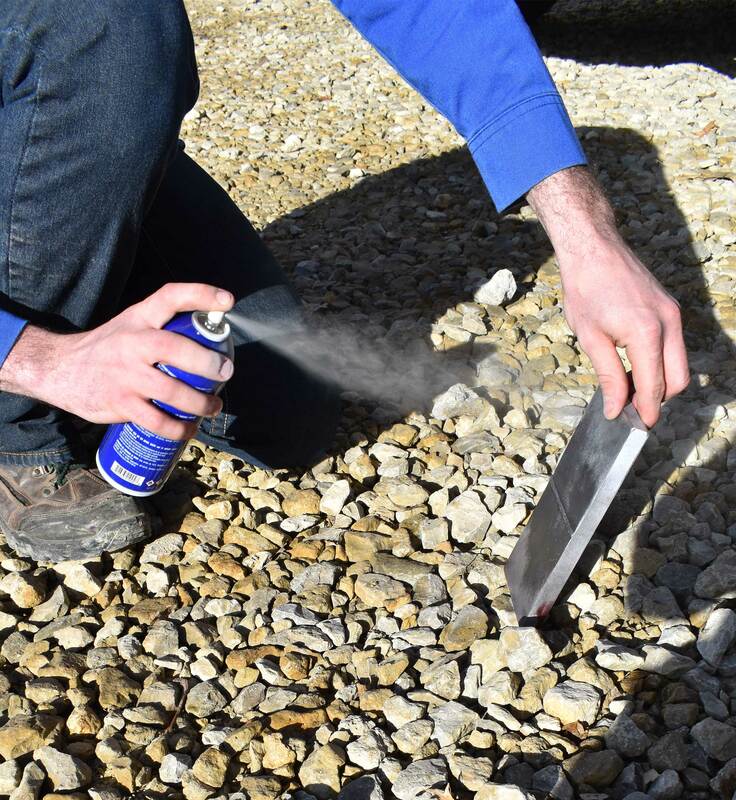 When using a non-aqueous, aerosol type developer make sure to thoroughly shake the aerosol can to ensure that the developer is mixed properly prior to application. Once shaken, spray a light/thorough coat of developer onto the test piece. DO NOT apply too much developer to the test surface. A trained technician will know the required amount of developer. Too much developer will mask indications and too little will not develop the indication sufficiently. Inspection of the test surface should take place immediately after the developer is applied, however the final inspection/analysis shall not be performed prior to 10 minutes post development. If fluorescent dye was used, UV lights as well as low ambient light levels would be necessary for final examination. Defects will be identified by contrasting “bleed outs” or indications. The larger the void in the test part, the larger the indication will be. Defects such as tight cracks or lack of fusion will sometimes produce very small indications that have to be watched for closely. The test surface may need cleaned after the inspection depending on the future service of the test piece.